These days it’s not unusual to read stories about game collectors buying rare game cartridges for thousands of dollars. But what is in those cartridges? Typically just code and data stored in one or more ROM (Read Only Memory) chips. In my last story, Fixing Gran Trak 10, I documented the first arcade game to use a ROM. The problem was which ROM? Was it the one we found over and over again with the number 74186 or was there an earlier, much rarer ROM with the number 74181? This idea was championed by one of my collaborators, Andrew Welburn, and supported by several pieces of obscure but provocative evidence: A track that appeared on an advertising flyer but not any shipping game we could find; A schematic for a an early development board called “proto-b” that no one had seen; A snapshot taken by one of the original game developers of his kids playing an early version of the game over 40 years ago. I waited as long as possible before publishing that story. I talked to everyone I could think of, but eventually I had to admit that I was stuck. Maybe by publishing I would get the word out and someone would step forward. I pushed the publish button and waited. I was still waiting six months later. Okay, a few pieces of context here. First, John Hardie is an old friend and co-founder of the National Videogame Museum. He knows his stuff. Second, by Portland, he is referring to the Portland Retro Gaming Expo where I would be later that evening. I was heading to the show to give a speech the next day with Ron Milner on Chasing the First Arcade Easter Egg. I told John that Tank boards are pretty easy to spot because they are two big boards connected by a ribbon cable, (I had just fixed a Cocktail version of Tank a few months earlier) and I went on to say that Tank was produced just after Gran Trak 10. Any chance he got one of those? I asked him to try to get closeups of the ROMs if possible. I didn’t have to wait very long. This was it. The holy grail that Andy, Tim Giddens and I had been looking for. After some gentle arm twisting, John agreed to bring me not just one PCB but six. He hand carried them in a box through security before boarding his flight from Texas. They didn’t blink an eye. I sat with John that evening in the hotel bar in Portland and carefully unwrapped the stash. 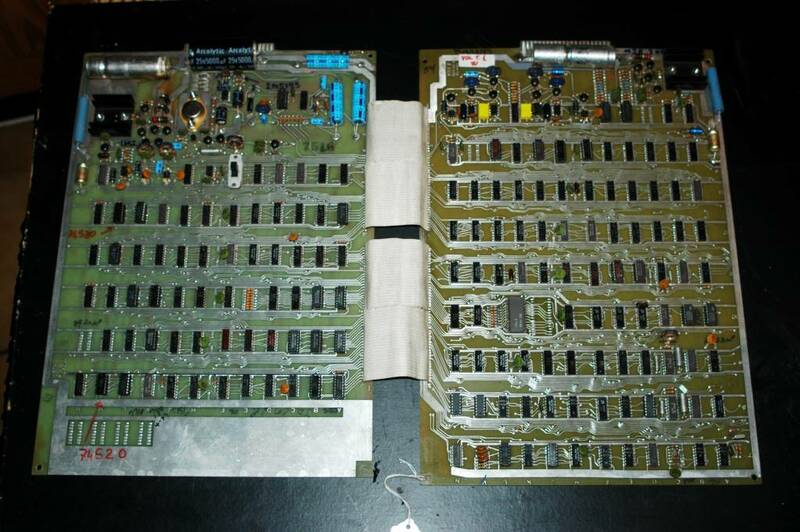 It included three Gran Trak boards, one of which held the precious 74181 ROM, and three other interesting boards including the first revision of the PCB for the game Gotcha (see Fixing Color Gotcha) . Monday morning I got to work. I took the board with the incredibly rare 74181 and carefully removed the ROM. I’ve seen pins rip right off old ROMs like this before but the chip is in great shape and it came out easily. Note the date stamp below the part number: 7401. That means it was manufactured in the first week of 1974. The earliest date stamp we have found on a 74186 is 7414. I put the ROM in my working Gran Trak 10 machine, said a short prayer to the god of engineers everywhere, and flipped the switch. There it was. The track as shown on the Gran Trak 10 flyer and as seen on the picture of the prototype Larry Emmons had sent me. Andy was completely right. There was an earlier ROM and it contained exactly what he said it would. I shipped the ROM to Tim that afternoon. He will copy the data and document every aspect of what he finds. (Here it is! 074181_memory_map) Then we will ship it back to the National Videogame Museum so it can be placed on display for all to see. Excellent stuff. I’m really looking forward to seeing the original track out there in the wilderness. On that note, I wanted to know if you had tried contacting Bob Walker which someone gave a lead to in the last post. If you haven’t had the time I can try to give him a call as I’ve talked with Atari employees before and would be happy to give it a shot. Typical story I really love to read. Congrats ! I’m curious about something: the 74181 is known as being a 4-bit ALU. What is this particular 74181 ? Same size as the 74186 (64×8 bits) ? Why does it have the same reference of the ALU chip ? Could this be also a very early version of what would become another ROM chip in the 74/74S series ? When you mention the use of the switch on your modified board, I suppose you switched between ROMs to compare the game tracks. Thanks for your details and for sharing. And once again, congrats. For an explanation of the chip number, please see the previous article (Fixing Gran Trak 10). The short answer is Al Alcorn chose that part number just to confuse people. It’s not a 7400 series part. As for the switch, my machine was modified (back in the day) with a physical switch that lets the player choose which of the two tracks in the ROM they want to play. It’s a very common aftermarket mod that you see in one form or another on many of these machines. Great read! Really cool to see this posted as you had alluded to “something exciting in your hotel room” during your panel at the show. THANK YOU so much for this blog….I have been helping a younger friend understand some of the intricacies of arcade game history (he needs to know for work)…Im a bit of a collector and done simple repairs like replacing monitor capacitors…Its been a real pleasure reading about your struggles and solutions on these repairs….Your process is similar to mine so I completely understand….And you’ve gone soooo much deeper into the workings then i ever was brave enought to try. AND youve been working on some VERY specific topics which my friend has been asking me about…Reading your blog enabled me to learn..then translate some of the cool and technical details at a level he can understand. This is not the first video arcade game to use a ROM. It is, we think, the first Atari video arcade game to use a ROM. An earlier video arcade game using a ROM, possibly the earliest video arcade game to use a ROM, is Ramtek’s Volly. According to Nolan Bushnell’s memories in 1975, Ramtek’s Volly was released late March 1973. MAME’s dump came from a Ramtek Volly PCB with an Intersil 5610C made in the 17th week of 1973, though that doesn’t necessarily establish the date. Thanks for the information. It looks like you are correct. Maybe I have to say the first large scale ROM or something! The one you mention is only 32 bytes. I suspect it contains something like the x and y offsets for the ball travelling at various directions. It’s not going to have graphics for a pong clone. Please let me know if you have access to schematics for this game. That should make it obvious what it does. Thanks again for the information. Perhaps there are more small roms like this from games in 1973? I had been looking at this but I didn’t really consider that it being dumped in MAME was a sure sign that it had a ROM, but that makes great sense. Likely all early Ramtek games have ROMs as well. I know Baseball was dumped, but that’s still a TTL game.